Invisible Majority: The Disparities Facing Bisexual People and How to Remedy Them focuses on the “invisible majority” of the LGBT community, the nearly five million adults in the U.S. who identify as bisexual and the millions more who have sexual or romantic attraction to or contact with people of more than one gender. 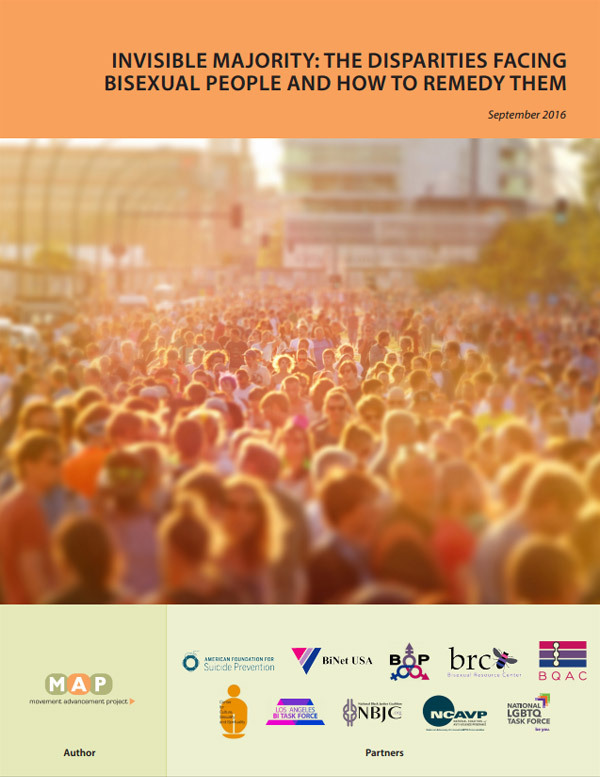 The report provides an overview of current research so we can better understand those who comprise the largest share of the LGB population. It also examines how bias, stigma, discrimination, and invisibility combine to create serious negative outcomes for bisexual people, and it provides concrete recommendations for change. Finally, sidebars throughout the report highlight the lived experiences of bisexual people—and the pervasive discrimination and key disparities they face. Movement Advancement Project. September 2016. Invisible Majority: The Disparities Facing Bisexual People and How to Remedy Them. http://www.lgbtmap.org/policy-and-issue-analysis/invisible-majority (date of access).